I’m exited to be included in Surfgirl this season. It’s one of the only magazines featuring female surfers and it’s put together really well. This issue, that has my interview in it, is made to be more like a book than a magazine. It’s thick and has high-quality images. Maybe it could be a Christmas gift for someone. Maybe it will be a Christmas gift for me! I’ve been checking my old mailbox almost every day. 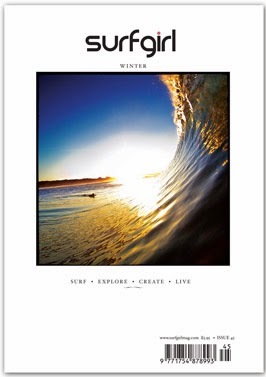 You can buy it online in the Surfgirl Boutique or at Barnes and Noble. If you buy it in the Surfgirl Boutique, the price is in pounds because the magazine is based in the UK (hence the use of the word “mum” instead of mom in my interview ;). Have a great weekend! Well done Devon, how lovely to see you in a magazine, and such a lovely one at that. I'm so pleased for you. More people should discover you! Hope you both have a really good weekend. Devon, this is incredible! Congratulations! Keep doing what you're doing, you're an inspiration. Thanks Julia!! I really appreciate the support. You're awesome. That is awesome Devon! Congratulations! I can't wait to check it out. 😀 thanks girl! You're so sweet! Congrats on the interview and magazine Devon. Might have to go online and make a purchase to read it! Have a great weekend. Cool, thanks Ross! Your support is so appreciated. Hope you're having a good day! Squee, super exciting lady!! Congrats! !